SHOP on Amazon to help support BTS!!!!! Through Nov 2, AmazonSmile is donating 5% (ten times the usual amount) to Beat The Streets Providence when you shop #AmazonSmile #StartWithaSmile. Click the banner and follow the link to our Get Involved page and sign up NOW!!!! Since 2013, we have led the effort to use athletics as a catalyst for change in Urban Rhode Island Schools. In six years we have brought co-education wrestling to 13 schools and 700 students in the Greater Providence Area. Beat the Streets Providence is a local non-profit committed to inspiring urban youth for success in school and life through the vehicle of co-educational wrestling. We use our program as a hook to draw at-risk students into a positive after-school environment where they receive mandatory academic support, connect to strong mentors, engage in healthy physical activity, learn about nutrition and general health, and incentives to attend and succeed in school. Only 22% of RI students are engaged in after-school programs. This small percentage of students has been proven to see the greatest gains in school while for the most part the rest, approximately 50% of Providence students, will leave school and be unsupervised from 3-6 pm. The loss of sport opportunity represents an important missed opportunity to reengage failing students in school. Research has proven that student athletes are more likely to attend school , feel more connected to school , report higher grades , experience better overall health , and are more likely graduate and attend college . 28 Hours of Free Programming A Week!!! Beat the Streets Providence was founded as a non-profit in the summer of 2013. Since then with the official support of our school district partners and community partners - such as the Providence After School Alliance - we have expanded to 7 Providence Middle Schools, 3 Providence High Schools, 2 Central Falls Middle Schools, and one community center program at the Davey Lopes Recreation Center. Over the past three years we have been able to provide wrestling, mentoring, academic support, health and wellness program, and a reason to stay in school to 700+ students and now, in the 2018-19 school year alone we will reach 500 students. Beat the Streets Providence starts after school wrestling teams which provide both youth development and academic support. 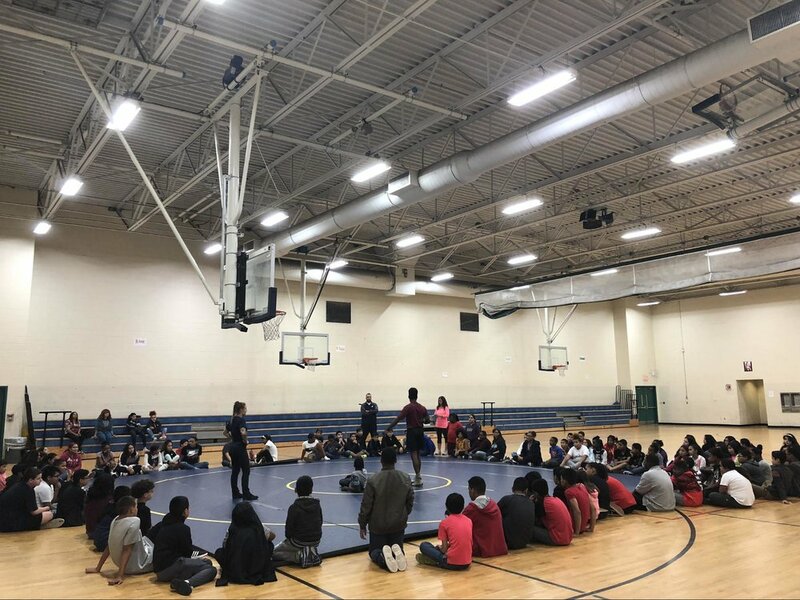 We use wrestling instruction and competition as an incentive for the most at-risk students, who otherwise would not choose to participate in after- school programming, to learn the study and life habits they need to succeed. We draw the students in to learn about how to study, persevere in school and in life, and hear the stories and experience of their adult community mentors to expand their own conception of who they can become. Wrestling is both a cost effective and equitable means to bring sports back to low income schools.Through wrestling our students learn discipline, grit, how to be part of a team, and the self-confidence that if they can succeed in wrestling they can succeed elsewhere in their life. What is unique about wrestling is that anyone can succeed in it, regardless of size or natural ability it is all about how hard you are willing to work! We pair everyone one of our students in a mentor group with one adult and four other students. This adult provides support to our students throughout the program and beyond. Dedicated students are also paired with a one-on-one community mentor. Everything in our program from simple participation, to competition, team gear, awards, and scholarships is all directly connected to school attendance. We recruit tutors from local colleges to provide 45 minutes of mandatory literacy focused tutoring prior to every practice. We engage our students in healthy physical activity and through a partnership with Blue Cross & Blue Shield of RI provide healthy meals to our often food insecure students and teach them about health and wellness through the framework of sports nutrition.